Fit on the outside – one more mile, 10 more reps, 6 more minutes feeling the burn. You know how to get the results you want for your body. What about strengthening your insides – your emotional frame? At any moment there is a lot going on in there and its wise to pay it attention. You will feel more confident, more self-aware, and more at ease with yourself. Who doesn’t want that? Distress Tolerance – Have you ever been running late to the airport and suddenly come up behind a very-slow-l–y—-moving car? And you start hyperventilating because you’re going to miss your flight if you don’t get moving asap? What you are experiencing is distress and it can really throw a wrench in your mood, and in your interactions with others, if it gets out of hand. It just doesn’t feel good. Instead of having an adult tantrum, practice calming yourself down with deep breathing. Be aware of what is going on inside you and what is making you upset. 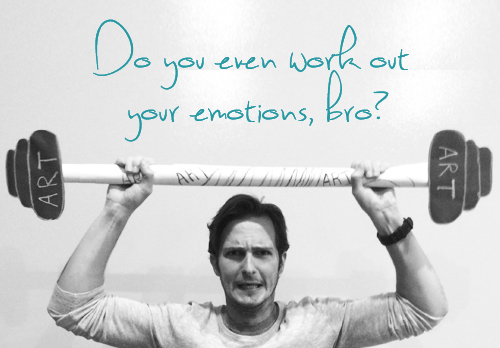 See if you can calm yourself physically and sit with your emotion. Observe what is happening inside you and why. This is a great way to build distress tolerance. Building your muscle for distress tolerance during “mini-crises” is a smart move that will help you better handle the big things when they happen. Vulnerability – I know what you’re thinking…….Eeewwwwww! The word doesn’t exactly evoke warm fuzzies, but that’s because it has gotten a bad rap. Vulnerability helps us stretch beyond our comfort zones and helps us grow. We need to develop our vulnerability muscles (or heal them if they have been wounded) because vulnerability is essential to healthy relationship. If you want to have intimate emotional connection, you have to be willing to be vulnerable. That is where trust, the building block of emotional intimacy, is created. Look for daily opportunities to be a little vulnerable and cut the protective crust off your proverbial grilled cheese sandwich. Step into the Resistance – Imagine you are holding one end of a six foot resistance band and the other end is attached to a weight-set sitting ten feet away. Obviously you can see and feel tension on the line because the band is being stretched. If you’ve ever found yourself in a situation that takes you outside your comfort zone, triggers you in some way, or that you just don’t know how to handle, you have probably seen and felt a similar tension inside yourself. It isn’t a very comfortable sensation if you’re there for too long. When the only part of the equation you can control is yourself, try taking a couple steps toward the ‘weight-set’ and watch the tension on the line reduce instantly. You don’t have to completely let go or withdraw, just stop pulling and the tension and discomfort will decrease, allowing you to think more rationally about the situation. Practice distress tolerance, vulnerability and stepping into the resistance on a regular basis. It might be uncomfortable at first, however, the benefits for your emotional well-being will be well worth it. It isn’t just one workout that makes us stronger, its the cumulation of multiple workouts over time.